CAUTION: An archery range is located within Shepherds Hill Recreation Park. Do not enter the area when red flags are flying. 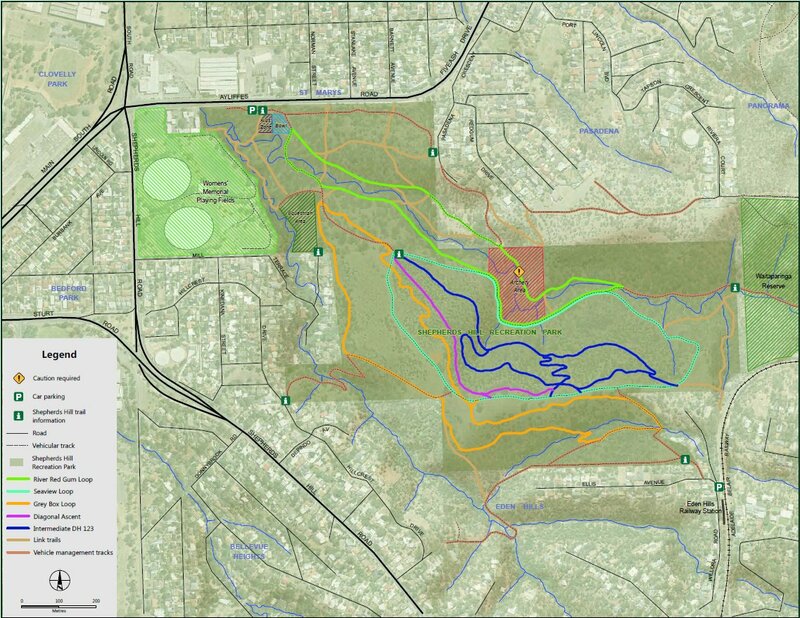 Yes Shepherds Hill Trails Map – available from DEWNR web site Shepherds Hill Recreation Park. Web site: Refer DENR web site Shepherds Hill Recreation Park. Shepherds Hill Recreation Park is located 11km south of Adelaide. Main access is via Ayliffes Road, St Marys and Ellis Avenue, Eden Hills. By train: On the Belair line it’s a 20min train ride from Adelaide station to Eden Hills station, then a 200 metre ride to access the park via Ellis Avenue, Eden Hills. By car: Park in the carpark on Ayliffes Road, St Marys. Get directions from your location here!. The park may be closed on days of extreme fire danger.